In the premises of the EuropeAid Cooperation office there was held an introduction session of the Secretary General of the PS IGC TRACECA, Mr. Eduard Biriucov with the representatives of Directorates of the European Commission: Mr. Jean Louis Ville, Head of Unit DG EuropeAid, Mrs. Carmen Falkenberg, Head of Sector, AIDCO, Ms. Barbara Bernardi, Programme Transport Manager, and Mrs. Svetlana Gligorovska, Policy Officer, DG MOVE. During the meeting the Parties emphasized the necessity to stimulate cooperation with the European Commission by closer coordination, joint elaboration of further reforms of the TRACECA structures in connection with a new role of the IGC TRACECA regarding the development of the EU South-Eastern Axis and integration of TRACECA Corridor with the Trans-European transport networks. Mr. Eduard Biriucov emphasized the necessity of promoting the political dialogue for the purpose of further effective development of the TRACECA Corridor. The representatives of the European Commission, the Secretary General and the Team Leaders of TRACECA technical assistance projects also discussed the current status of the projects and the tasks for the next year. 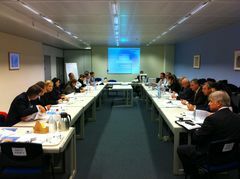 The participants of the meeting reached an agreement regarding the arrangement of regular annual coordinating meetings with participation of the European Commission, the Permanent Secretariat, National Secretaries and technical assistance projects with the view of ensuring concerted actions between the PS IGC TRACECA and technical assistance projects as well as discussing the issues of projects` implementation and the ways to achieve the best results.